Genuine replacement Kohler valve diverter and transfer cartridges. Kohler faucet Single Control Faucet Cartridges for kitchen and bathroom sink fixtures. Shop for genuine replacement Kohler faucet cartridges. Genuine replacement Kohler Single Control Shower Cartridges to fix your tub and shower valve. 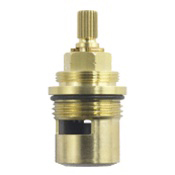 Find new Kohler Rite-Temp cartridges and older style Niedecken replacement parts. Genuine replacement Kohler faucet and shower stems for two handle valves. From old style Kohler Valvet to newer style ceramic disc stems, we stock almost every Kohler stem available.